10 years ago Tony Kaye banged his head while climbing from under his desk to answer the phone while fixing another IT issue. The caller suggested Tony called Pro-Networks who look after their IT, and on 10th April 2014 Geoff Coote and Tony Kaye shook hands on another year of support. 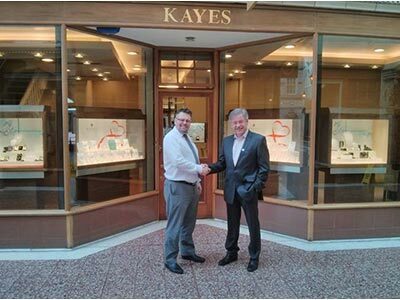 Now entering the 10th year, both Kayes Jewellers and Pro-Networks enjoy a mutually beneficial, honest relationship and Tony had no hesitation in agreeing another year for support. "The Office PC was full of Malware and we needed to roll out Service Pack 2 for Windows XP. So chatting to Tony about the next year’s IT support and planning the direction of the next two to three years IT was a good way for us both to spend the early part of our morning."